Step 1: Parted my hair on a slant so that one side would have more hair than the other. Then I clamped one of the sections to keep it out of the way. Step 2: Applied moisturizer to section and detangled thoroughly with denman brush. Step 3: Opened pack of kanekalon hair. Took the entire pack of hair and while tightly holding my hand about about 6 inches from the very end of the bundle, I thenbegan to gently pull a couple strands at a time so that the end of the bundle was no longer blunt and equal in length but more frayed in appearance and pulled to various lengths. Step 4: I detangled the braiding hair with brush. Step 5: I parted a small section about 1 inch in width and length then split the bundle of hair into two parts. One part should be a 1/3 of the bundle and the other should be 2/3 of the bundle. Step 6: Took the piece that was a 1/3 and looped it around the piece that was 2/3 then pulled tightly. 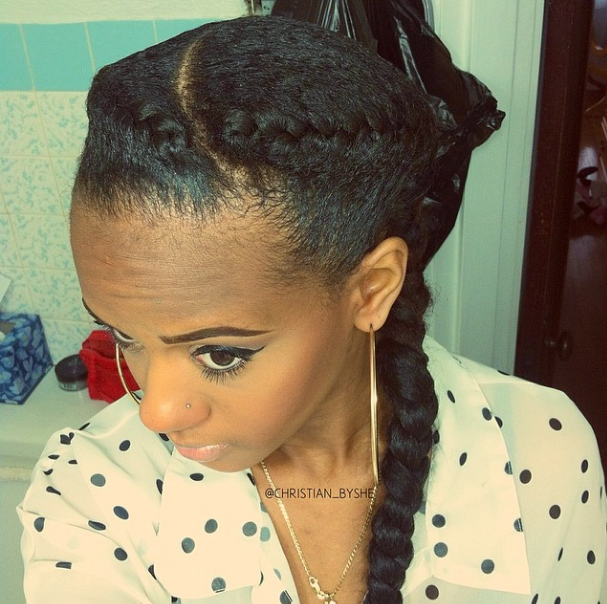 Step 7: Placed prepared extension hair underneath natural hair at the front of my head and began braiding like I was attaching a box braid. Step 8: Once secure, continued braiding until I reached the nape of my neck and then clamped the braid so it wouldn’t unravel. Step 11: Took a significant amount of gel and smoothed down sides leading up to each braid. Then secured with a silk scarf and allowed to dry. 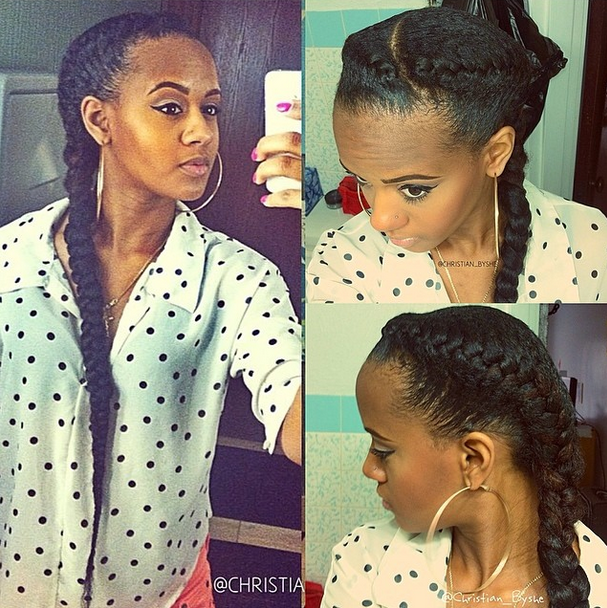 Do you rock Goddess Braids? How do you do yours?